The arrests come several days after three other bison protesters were charged with misdemeanors after staging a similar protest. According to the Bozeman Daily Chronicle, the pair (identified as “Coyote” and “Wolf”) belong to Wild Buffalo Defense, a coalition of activists that seek to highlight living conditions for Yellowstone bison and protest their treatment under the Interagency Bison Management Plan. You can see a photo of the pair below, posted on Wild Buffalo Defense’s Facebook page, courtesy of the Chronicle. A post on Wild Buffalo Defense’s Facebook page says the two people locked themselves to three 55-gallon barrels filled with concrete on the road leading out of the Stephens Creek Capture Facility before dawn Friday. Photos on the page show the drums painted with messages about protecting bison and honoring treaties between the U.S. government and Native American tribes. Monty Slate, a spokesman for Wild Buffalo Defense, said the pair’s actions delayed a shipment of bison to slaughter for a few hours. He said a path was cleared around the protesters. About two weeks ago, a pair of protesters chained themselves to the squeeze chute at Stephens Creek, where biologists take blood samples of bison. A third protester was arrested after rangers saw her leaving the facility. All three served six days in jail before pleading guilty to charges Monday, March 12. All three were ordered to pay fines, perform community service, and are banned from Yellowstone for five years. The Buffalo Field Campaign, another bison advocacy group, issued a statement of solidarity shortly after the squeeze chute arrests. Bison corralled into Stephens Creek are either shipped to slaughter (with the meat and hides distributed among Native American tribes) or held back for quarantine. The latter practice highlights a schism among environmental and coalition groups otherwise united in their opposition to bison hunting and slaughter; some see quarantine an acceptable alternative to slaughter, while others see it as an attempt to domesticate wild bison. Twice so far this year, unknown persons have cut fences twice at Stephens Creek to release bison being held there. The first fence cutting happened in January, while the second happened in February. The National Park Service started criminal investigations into each event. 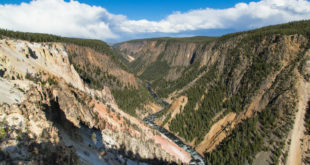 In February, Yellowstone National Park announced it would increase security around Stephens Creek, although it had declined to say what measures it would take. IBMP officials this year proposed culling 600 to 900 bison from the Yellowstone herd. So far, over 550 bison have been killed through hunting and slaughter. In addition to these protests over the past few months, there have been several important legal matters pertaining to Yellowstone bison management. Last month, a Bozeman law firm sued to block hazing of bison north of Gardiner, Montana, arguing the animals should be allowed to push north into the Paradise Valley. Meanwhile, a decision is expected later this year on whether Yellowstone bison warrant endangered species protections, after a judge sided with bison advocates against the U.S. Fish and Wildlife Service.